Cycfi Inc., Neo Pickups Coming Out…Soon! Notice that this guitar player is assuming a classical guitarist’s seated posture, playing Francisco Tarrega’s “Recuerdos de la Alhambra” on a Fender Strat, but it does not in any way sound like your typical quacking Strat! (I would know how a Strat should sound like because I grew up with one). Matter of fact is that it sounds eerily close to a concert classical guitar. I’ll be first to admit that (having had some classical guitar training) certain nuances like the sustain and attack of the notes would give away that it’s not a classical guitar, the timbre is very close that only classical guitar nuts (like some of the people I know) would be able to tell that it’s not. Perhaps there is some form of bias on my part that I know it’s not a classical guitar (having physically manipulated that guitar), but it would be safe to assume that a casual listener might not be able to figure it out. Is it a MIDI guitar, a Martin, a Taylor, a Gibson, EMG 81s? None of the above, folks! It’s just a Fender Strat with Neo Pickups. Heck, the guitar could have been a cheap knockoff and it would have sounded like some of the most expensive guitars in the world with those pickups. I suppose it would be safe to say that what the E-Bow people call “string synthesis” could be easily done with Neo Pickups. Who needs MIDI guitars when you have these, right? And it is very obvious that I am GASsing for one of those that I already envision taking out the EMGs on my ESP LTD and replacing them with these. Without a doubt, I will soon write a composition utilizing these pickups (with the side effect of fulfilling one of my composition requirements at the university, hahaha!). The Cycfi Neo Pickups target release date will be somewhere around March 2014. For more details, visit http://www.cycfi.com/projects/neo-series/. One of the things that make many musicians scratch their heads are the modes. Let’s face it: They are so confusing yet in fact you need to learn and understand how to use them if you want to improve your musical skills and knowledge. We always hear how to use the modes in everything from writing songs to soloing over a complex jazz piece. In this piece, I’m going to show a couple of ways regarding how to understand modes. Now, for us to understand this tutorial, we need to know what a major scale is and the names of the modes. Since we have seven notes in the major scale, we also get seven modes. We have this nice graphic above that shows our C major scale and its relative modes. We can easily play the each of the major scale’s relative modes by starting the same major scale at a different note and then we name the mode according to that starting mode. For example, if I want to play D Dorian, I just play the C major scale a.k.a. Ionian mode starting at D as a root. Sound-wise, you will notice that by starting the same scale at a different note, you rearrange the order of intervals. Add to the fact that you now consider the different note as the root note, you will tend to return to it every now and then, making you hear a scale that is very different from your original major scale. …the Ionian mode, we start our major scale at the 1st note (it’s just the same major scale, duh!) (I). …the relative Dorian mode, we start our major scale at the 2nd note (ii). 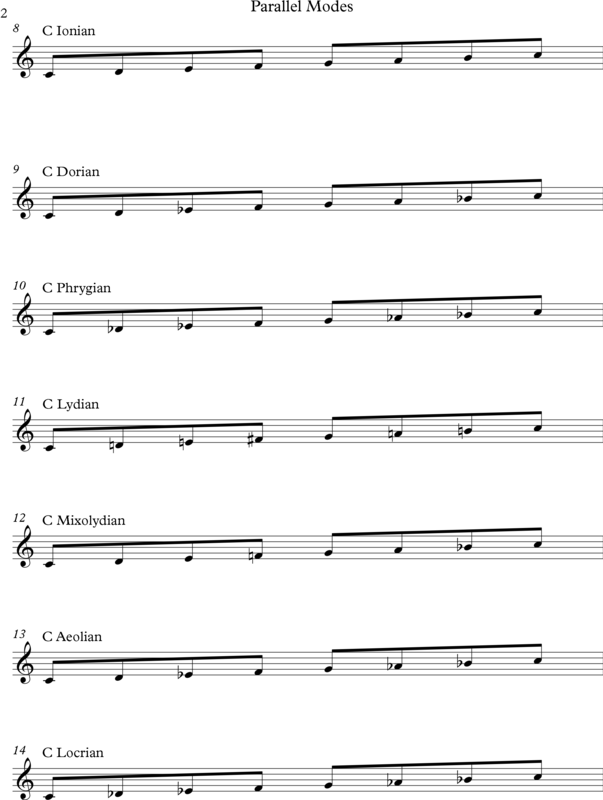 …the relative Phrygian mode, we start our major scale at the 3rd note (iii). …the relative Lydian mode, we start our major scale at the 4th note (IV). …the relative Mixolydian mode, we start our major scale at the 5th note (V). …the relative Aeolian mode, we start our major scale at the 6th note (this also happens to be our relative minor scale) (vi). 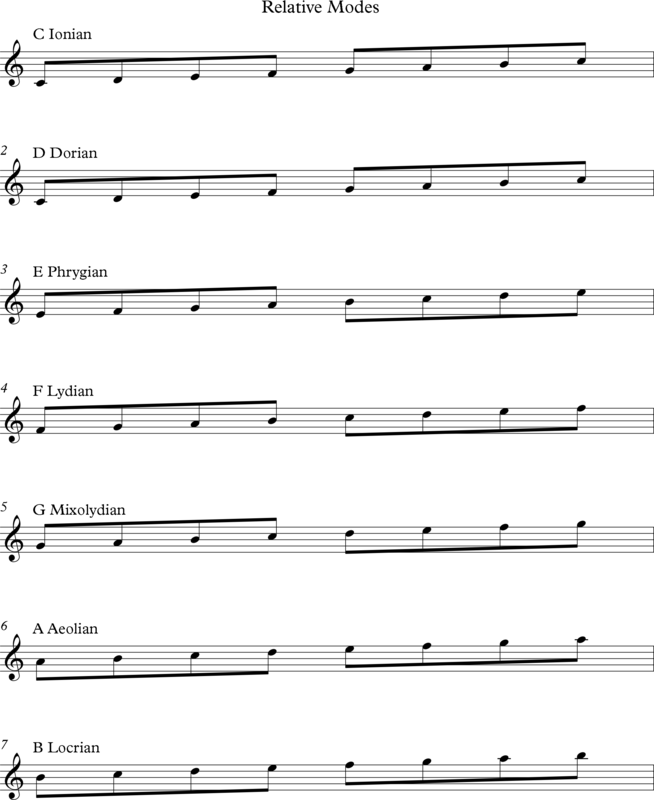 …the relative Locrian mode, we start our major scale at the 7th note (vii). Figuring out how to learn and play the parallel modes (e.g. C major, C locrian, C Phrygian, etc.) is a trickier thing. There are a number of ways to do it. The technical way is to analyze our relative modes, check the order of intervals, and then apply that order of intervals to a particular root note. For example, I know that the Ionian mode/major scale follows the order of whole step (W)-W-half step (H)-W-W-W-H pattern of intervals. By looking at, say for example our E Phrygian in our relative modes section, we find out that the pattern is now H-W-W-W-H-W-W with a flat 2nd. So, let’s say I want to know what Bb Phrygian is, I figured out that it is Bb-Cb-Db-Eb-F-Gb-Ab. I can do the same procedure for the other modes. Quite taxing, isn’t it? Still too difficult to figure out by this method? Okay, by doing it this way, it does involve some time to study. However there are easier ways. Let’s say that I want to play a D Mixolydian. Now, from the study of relative modes, I know that Mixolydian is the 5th mode and so its root note is the 5th note of a particular major scale, which I find out to be G in this case. And so, all I have to do play D Mixolydian is play the G major scale but start with the D.
Let’s also say that I want to play Ab Phrygian instead. Since Phrygian is the third mode, Ab is the third note of the Fb major scale. Now, you might say, “What the hell, Mark! There’s no such thing as Fb major.” Relax, I’ll explain it for you. From a strictly music theory standpoint, there is. But for the sake of practical use, it is just the E major scale, and so now we think of Ab as G# and then play the E major scale starting at G# to get ourselves the Ab Phrygian mode. I think that this is the simplest way of learning and playing the modes. As for actual use in songwriting, composition, and soloing using modes, there are plenty of resources on the web for that. Anyway, you can always drop a line or two at the comments box if you have questions regarding modes and other stuff. Thanks.